The Library Bar on Bastille Day; photo from Facebook. 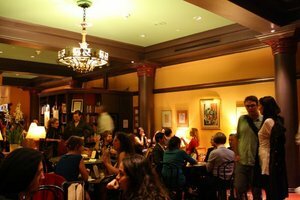 A tablehopper tipster let me know Tyler Florence reportedly has a project brewing at the ~HOTEL REX~, a Joie de Vivre Hospitality hotel in Union Square known for its comfy Library Bar and bohemian style. I checked in with Tyler, who said he wasn’t ready to release any details yet, but that they are in the final planning phase and it’s going to be “very cool.” The Library Bar currently has a menu of salads, sandwiches, and more, and there’s the currently closed Café Andrée space in the front of the hotel, so we will all have to just stand by and see what surprise TyFlo has up his chef’s coat sleeve for the place. 562 Sutter St. at Mason, 415-433-4434. Photo for Ocean Beach Bulletin by Kristine Mendoza. 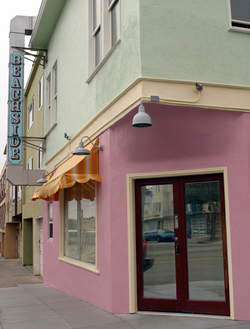 The Ocean Beach Bulletin has an extensive writeup about ~BEACHSIDE COFFEE BAR AND KITCHEN~, a new restaurant opening Thursday August 25th in the Outer Sunset. Eater originally revealed the project is from the team behind Java Beach, Pat and Buffy Maguire. There will be espresso off a gleaming La Marzocco machine and a house-built drip station, featuring a niche coffee selection that will rotate. They’re also doing a special cold press iced coffee: coarsely ground coffee that is steeped for 24 hours in cold water and then strained, which is double the concentrate, and it never touches heat! I gotta try it. The owners sent me a menu, letting me know all meat, produce, and products are local, sustainable, and/or organic. There’s a fried egg sandwich, bacon waffles, and more for breakfast (surfers will be stoked); and for lunch, Buffy is making his grandfather’s meatballs in a sandwich, plus there’s a fried chicken sandwich, pulled pork sliders with frizzled onions, and the vegans can tuck into a special banh mi (if you don’t want a sandwich, you can turn any of these items into a salad instead). There will also be homemade cookies, a cold press coffee snow cone with salted caramel, cotton candy, and Straus soft-serve ice cream. There will be around 25 seats, plus some outdoor seating. Hours to start will be 7am-7pm (or later). And please note, there is no Wi-Fi, so leave the laptop at home. 4300 Judah St. at 48th Ave., 415-682-4961. Bao from a Dumplings & Buns test lunch. Photo: © tablehopper.com. Opening in the Upper Fillmore this coming Monday August 29th is ~DUMPLINGS &AMP; BUNS~ from owner May Lee Iorfido. On the menu: savory pork or chicken bao, a variety of dumplings (pork, chicken, pea shoot, or shrimp), wonton soup, and a soba noodle salad with baked tofu and cabbage (it’s a tasty one). 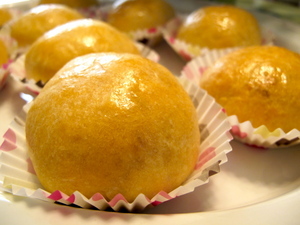 There are also sweet custard buns and “boozer buns” with flavors like Chocolate Kahlua, Lemon Cointreau, and May’s Favorite Amaretto. Check out the entire menu (with pricing) here. You’ll be able to dine in (there’s limited seating) or take out (you can order ahead online). There’s also a grocery component, stocked with sauces, mustards, kimchee, and jams. Hours will be 11am-8pm daily. 2411 California St. at Fillmore, 415-292-6209. Want to check it out before it opens? Dumplings & Buns will hold 50 slots at the pre-opening party/test run this coming Saturday August 27th for the first 50 tablehopper friends. That’s right—you can go and get a combo plate of three different dumplings and a BBQ pork bao for free, plus you can try sweet custard buns (very vanilla, deep chocolate, or ginger orange) for only $1 each (which is half price). All you need to do is send an email here, give your full name, and indicate what time you want to come between 11am-4pm. Just be sure to put “tablehopper sent me” in the subject line! Have fun, dumpling fanatics! The Return of Charles Chocolates! Chuck Siegel; photo from Facebook. Yup, it’s true: you’ll be able to get your favorite peanut butterflies and chocolate-covered nuts again, and hopefully soon! After following up on a tip (thanks readers! ), I got in touch with ~CHARLES CHOCOLATES~ founder Chuck Siegel, who told me he was able to buy his business back! The company suddenly closed when a former investor foreclosed and forced the company into bankruptcy—but a couple months later, the investor’s attorney said, “Make us an offer,” and Siegel was able to buy the assets back. Unfortunately he lost his lease on his kitchen, so now he’s currently searching for a space big enough that is suitable for food production, and ideally in San Francisco (although he is also scouting in the 510). A lot of his original crew would like to return and work for him, so here’s hoping he finds a space before the holidays get any closer (if anyone has any leads, he’d love to know). You can follow Charles Chocolates on Twitter for updates. Interior photo from La Fusion. After some initial sightings by Eater and Grub Street, ~LA FUSION~, a Nuevo Latino establishment, is opening this Wednesday August 24th in the Financial District. It’s opening in the former Krivaar Cafe space, which is a tiny one. 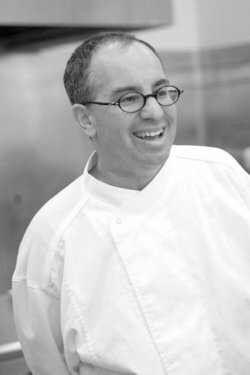 Chef-owner Javier Madero is reportedly a native of Mexico City but has cooked all over the world. The menu (take a look at it here) includes a variety of small plates served family style, including a number of ceviches, like a Spanish mackerel cebiche ($11) with charred skin, citrus wedges, lime juice, and huacatay mint sauce. A highlight is the rotisserie chicken, available by the quarter, half, or whole, and served with warm bread salad, one side dish, and aioli sauce ($8-$19.95). There are also empanadas ($5.50-$8), and small hot plates like beef ribs ($16) braised in dark beer, cilantro, huacatay, served with carrots and corn purée. Hours are lunch Mon-Fri 10:30am-3pm, happy hour Wed-Fri 3pm-6pm, and dinner Mon-Sat 5pm-10pm. And for you “eat at your desk” types, take-out is available. 475 Pine St. at Kearny, 415-781-0894. Chicken potpie with green chile sauce; Yelp photo from Keilin H.
A while ago I reported a second location of ~CHILE PIES (&AMP; ICE CREAM)~ was opening in the Castro in the former No Name sushi space, and Eater notes the space is now open for business. A pie milkshake, you know you want it. 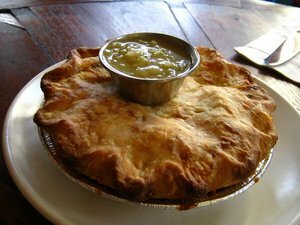 There are also sweet and savory pies, like the green chile chicken pot pie, vegetable pot pie, and the new carne asada red chile pot pie. Grab a seat at the small-ish counter and dig in. Hours are 11am-11pm. 314 Church at 15th St. Remember ~FIVE STAR TRUFFLES~ that was on Divisadero and then sadly got the boot? Well, they recently re-opened in the Castro, so you can swing by for your espresso and truffle needs. There are over 25 handmade chocolate truffle flavors to choose from, plus vegan creations, and hot chocolate and coffee drinks. Open Mon-Sat 8:30am-8:30pm, Sun 11:30am-7:30pm. 4251-A 18th St. at Diamond, 415-552-5128. Kugelhopf photo by Kristen Baggerly for SFoodie. For those of you who checked out pastry chef Belinda Leong’s baked goods pop-up at Flour + Water a couple weeks ago, you’ll be happy to know you can now find her goods at Four Barrel Coffee and Bar Agricole. SFoodie reports, “she will make European-style pastries three days a week while maintaining her position as pastry chef at Manresa. 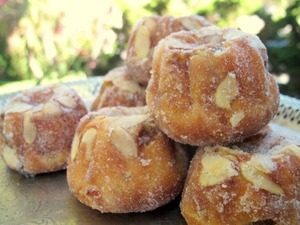 The two locations will initially sell her kouign amann (layered French pastry), kugelhopf (small Alsatian cake), sable chocolate (double chocolate cookie), and a seasonal coffee cake.” She will reportedly leave Manresa in October in order to ramp up into full bakery production mode, and will widen her distribution to other outlets. The piece also mentions she is looking for a San Francisco location to open b. Patisserie, her retail shop. Is 2011 the year of pastry? I think so. Yay. There’s a new executive chef at the ~GRAND CAFÉ~, Alicia Jenish, who was the opening chef at Revival Bar + Kitchen in Berkeley. She has also worked with Charles Phan as opening chef of the Academy Café, and spent time in the kitchen at his OTD Westfield, along with working at LarkCreekSteak and four years at Le Petit Robert, where she worked her way up to chef de cuisine. Alicia is actually going to be spending her first few weeks traveling, and will be introducing her debut modern French brasserie menu in early November. It's Time for the Random New Project Roundup! Hot sauce photo by Luis Chong for SFoodie. A few little tidbits around town: after some mentions in Inside Scoop and Eater, it appears ~LITE BITE~ has opened in Cow Hollow (across from Roam Artisan Burgers). The concept: healthy, grab-and-go options, from salads to sandwiches. Open 10:30am-7pm. 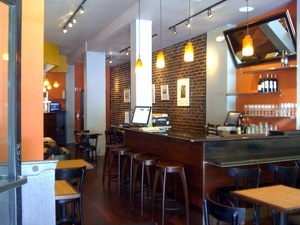 1796 Union St. at Octavia, 415-931-5483. Bernalwood notes the ~PALACE STEAK HOUSE~ has reopened (with new owners), and the menu of steaks, burgers, and sandwiches seems to be mostly the same as before, and it’s all under $15. Lunch and late-night hours are reportedly in the works. 3047 Mission St. at 26th St., 415-647-2011. SFoodie mentioned the opening of ~HOT SAUCE AND PANKO~ in the Richmond. Not only is there a retail shop with a selection of hot sauces (rawr), but there are also some hot dishes, like wings and waffles. Quirky alert! 1545 Clement St. at 17th Ave.
No idea about the timing on this one, but ~THAI BISTRO AND LOUNGE~ appears to be the name of the business moving into the former California Pizza Kitchen space on Van Ness. The project is a ways off: the space is gutted but nothing really Thai nor bistro nor lounge is apparent yet. 524 Van Ness Ave. at McAllister. Tipster Jason B. let me know about the ~TASTE~ tea room that opened in Hayes Valley. It’s actually been open for a couple months, but this is the first I’ve heard of it. 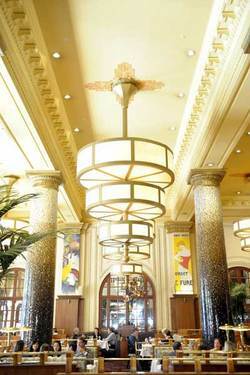 Yelp reports mention friendly owners, nice atmosphere, and Gong Fu Cha (Chinese tea ceremony). 535 Octavia St. at Grove, 415-552-5668. Curry Up Now Is Launching a Dosa Truck! 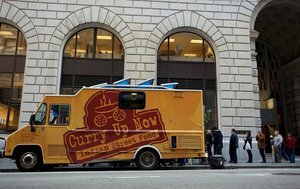 Curry Up Now truck; photo © Michelle Edmunds. The ~CURRY UP NOW~ folks just can’t seem to stop coming up with ideas. Up next from the crew is a dosa truck which will offer dosas ($8-$9) with the same fillings as their kathi rolls. It will all come wrapped up like their kathi rolls (which uses paratha) with the sambar (lentils) and chutney inside, along with potato, and you will have the option to add an egg inside (because you’re crazy like that). Also on the menu: deconstructed idli (steamed rice cakes) and vada ($6-$6.50)—and tacos made with uttapam! They will be trying out the new dishes in Redwood City and Sunnyvale this week, and hope to launch the truck by the second week of September. It’ll also have a name by then as well—they’re still mulling over a few options. And I’m confident it’s sure to be creative. The fabulous Afro Urbanites event flyer. 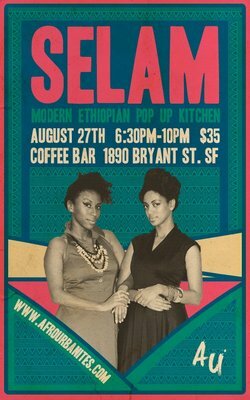 This Saturday August 27th, swing by ~COFFEE BAR~ for a modern, regional Ethiopian dinner by the Afro Urbanites (some of you may be familiar with these two Ethiopian/Somali women through their Selam pop-up events at Guerilla Cafe in Berkeley). There will be two seatings (6:30pm and 8:15pm) for the three-course meal (with a vegetarian option), and an Ethiopian coffee roasted onsite. $35. Reserve here. Fan’s of Preeti Mistry’s SoMa pop-up ~JUHU BEACH CLUB~ will be sorry to learn Friday is her last day in the current spot. She’s looking for a permanent location where she can do both lunch and dinner, and hopefully serve beer and wine. Stand by for updates. 320 11th St. at Folsom. I received a note from Joanna Karlinsky of Meetinghouse biscuit fame about her new Sunday brunch at ~THE CORNER~ called Sweet Jo’s Chili & Biscuits while she looks for a more permanent location. On the menu: Meetinghouse biscuits with toppings such as pork sausage gravy, Meyer lemon curd, and collard greens and ham hock stew. There will also be an array of her delicious chilis to eat on premise or to take to go. Sun 10:30am-2:30pm. She is also going to be serving Thursday and Friday supper at ~OASIS CAFE~, starting at 6pm. 901 Divisadero St. at McAllister. Little Vine owners Jay Esopenko and Melissa Gugni; photo by Aaron Kohr. I love it when my readers start one of their own businesses! 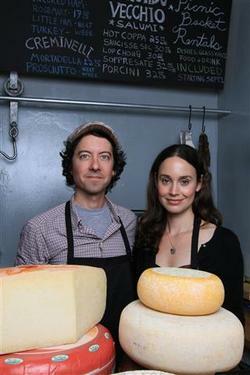 Couple Melissa Gugni and Jay Esopenko just opened their artisan food shop, ~LITTLE VINE~ in North Beach (today is their grand opening). They were inspired by their travels in Europe, and their shop will offer an extensive selection of cheeses, salumi, organic beef from Marin Sun Farms, pasture-raised poultry, Soul Food Farm eggs, and seasonal produce. The floor-to-ceiling shelves are filled with items from the couple’s favorite small producers, and lucky you, you can pick up croissants, kouign amann, tarts, cookies, muffins, and scones from Starter Bakery. There will also be SPOT bagels, Full Belly Farms produce, and Three Twins Ice Cream, plus organic, fair-trade, individual pour-over coffee from San Francisco’s Bicycle Coffee Company. I am getting fat just reading that list. For those on the go, you can grab a pre-made sandwich—or for those with more time to kill, you can borrow one of Little Vine’s vintage picnic baskets for a picnic in nearby Washington Square Park. They are hoping to get a permit to sell wine soon, but for now, their excellent array of cheeses are sure to keep people happy. Open Tue-Fri 11am-7pm, Sat 10am-7pm, and Sun 11am-5pm. 1541 Grant Ave. at Union, 415-272-7567. Jasmine Tea House photo by Yelp user L.Y. 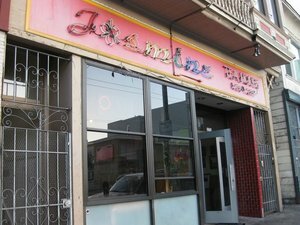 I was sorry to read in Bernalwood that ~JASMINE TEA HOUSE~ has suddenly closed. Some vegetarians are gonna be bummed. 3253 Mission St. at 29th St.
And my favorite tipster Jason B. alerted me that after 22 years, ~CAFE CORBAS~ in Hayes Valley has closed. He said, “A sign on the window said goodbye.” 364 Hayes St. at Franklin St.
Little boar; photo from Flour + Water’s Facebook page. This little piggy went to ~TRADER VIC’S~ in Emeryville for a Lahaina Luau on Friday August 26th, featuring Kalua roasted pig, passed appetizers (including pork belly and Maui pineapple kabobs), and a sit-down dinner. $39 per person (not including tax and gratuity), and $5 Mai Tais. Cocktails and appetizer reception at 6:30pm, dinner served at 7:30pm. Reservations required. 9 Anchor Dr. at Powell, Emeryville, 510-653-3400. 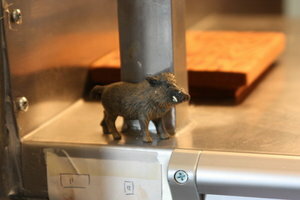 This little piggy went to ~FLOUR + WATER~ on Friday September 2nd, for a wild boar dinner by executive chef Thomas McNaughton in the Dough Room. The five-course menu will feature paired wines. Two seatings: 6pm and 9:15pm. $200 per person, inclusive of tax and gratuity. Tickets here, or contact Kara Bratcher at 415-826-7000. Photo of Ceres from the Vesta Facebook page; photo by Mark Becker. 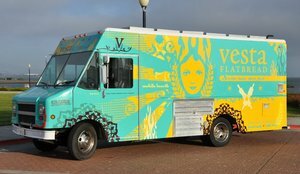 I received an invite to check out the new mobile truck from ~VESTA~, which the owners are describing as a “mobile hearth on wheels.” They named it Ceres, and you’re going to want to follow it on Twitter and Facebook to see where you can score one of their delicious homemade flatbread sandwiches (made with organic ingredients). There’s also a spit rotisserie. The official launch date is Thursday August 25th. After a tip-off on Chowhound, it appears ~UNCLE DOUGIE’S~ in Oakland has opened a second location that is conveniently near UC Berkeley’s campus. Yelp reviews mention there are four kinds of heroes: chicken parm, eggplant parm, meatloaf, and sausage and peppers. Hours are Sun-Wed 11am-8pm and Thu-Sat 11am-3am (sweet). 2328 Bowditch Way at Bancroft, 510-705-1686. Open today on Piedmont Avenue is ~LOCAL CAFÉ~, next to Adesso. The Piedmont Patch recently posted a detailed article about this project from first-time owner Megan Burke and David Crombie (the original general manager at Mulberry’s Market). The chef is Colin Etezadi (previously at Boot and Shoe Service), who will be serving breakfast and lunch (Inside Scoop just posted a PDF of the menu here). Open Tue-Sun 7am-3pm; dinner Thu-Sat will be added later. 4395 Piedmont Ave. at Pleasant Valley, Oakland, 510-922-8249.